The digital future for your company is right now. In all industries and businesses, we have reached the point when systems are no longer just tools to automate processes and drive efficiencies. They are also core components to achieving business strategy and are integral to establishing customer relationships. The companies that compete and win are the most effective at aligning their business strategies with their technology execution. Unfortunately, far too many technology initiatives start with the development of a long list of requirements and selection of vendors. Executives are sold on the bells and whistles of a solution and the business’ underlying needs are lost in the process. The assumption being that the process of applying new technology will, in itself, deliver the value and drive performance improvement. Of course, this is not the case. CIOs who take a strategy-first approach to selecting a [ERP] vendor will deliver 60% increased business value over those who take a vendor-first approach. It is no secret that systems implementations from ERP to CRM to Cloud Migration, present a risky and complex journey for any organization, and that many executives’ reputations ride on their success or failure. Not to mention, in this post-modern age, the expectations and risks are highly elevated. Vendors promise flexibility and agility that allow companies to scale and rapidly adopt new solutions while deep analytics with information at their fingertips will enable better, faster decision-making. 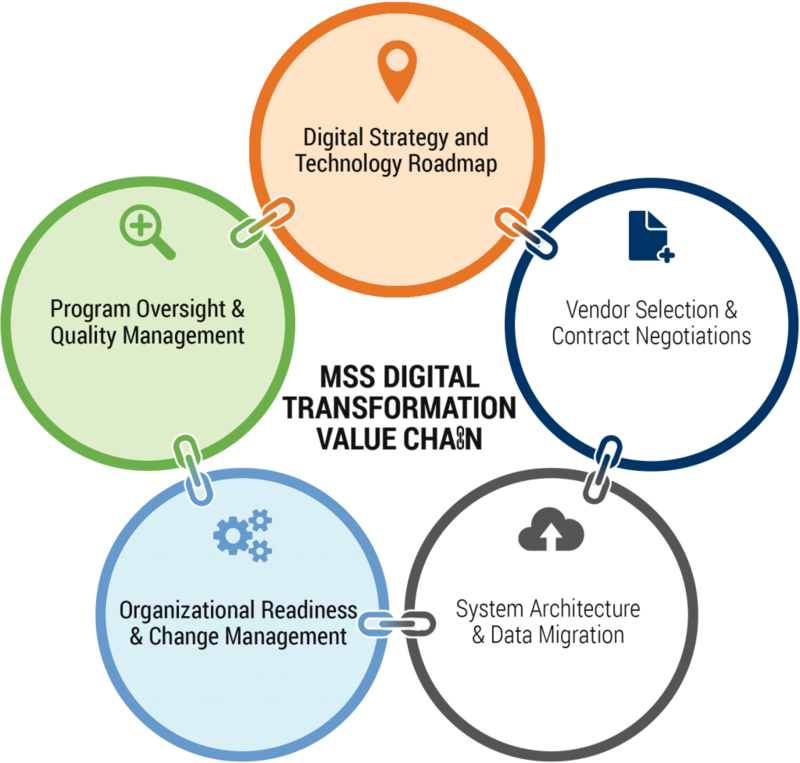 Yet, with each new solution, the level of complexity and the potential for hidden costs and unforeseen challenges increases exponentially, and these missing key components of the implementation process becomes even more important. When embarking on a technology initiative, the key to success is to treat it as a business initiative owned and led by business leaders who actively instill the organization’s vision, competitive position, financial structure, and operating model. Moreover, treat it as a change initiative where the highest degree of success is based on 100% of the impacted people adopting the change. If you think about it, no other multi-million business investment would kick off without an understanding of how it drives the company strategy, how it is going achieve a return on investment, and a plan for how it will achieve its goals. Done correctly, a digital transformation can increase customer-centricity, break down functional silos, engage employees and drive transformational change to your organization. Done poorly, complex initiatives have a failure rate that few organizations can absorb. John Wieser, Richard Taylor, and David Lee contributed to this article.